Gai and I had enjoyed the last moments of our time in France. It was time to drive to Italy. It’s kind of cool saying that! We had been in Europe for most of the year and we were getting tired. We had shot 12 of the 13 episodes for our television series Village to Villa. Up to this point we had amassed more than 135 stories. We love road trips and this was going to be a big one … 1,300 kilometres or more than 800 miles! Phew! Between our two points of Western France to Central Italy there is spectacular scenery, dozens of major attractions and a massive mountain range accessed by a long, long tunnel. We had become quite proficient at shooting videos on the road. 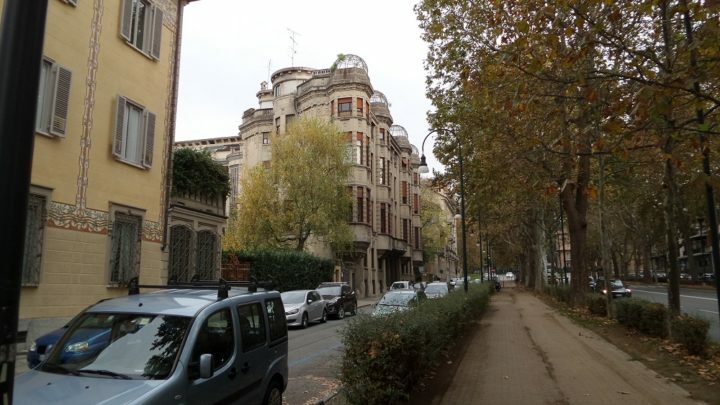 We ended up with a lot of ‘road’ vision during this trip with stops at the fabulous Lake Annecy, in the Haute-Savoie region of France, the amazing Italian city of Turin in northern Italy, and one of our all-time favourites, Florence, capital of the Tuscany region. 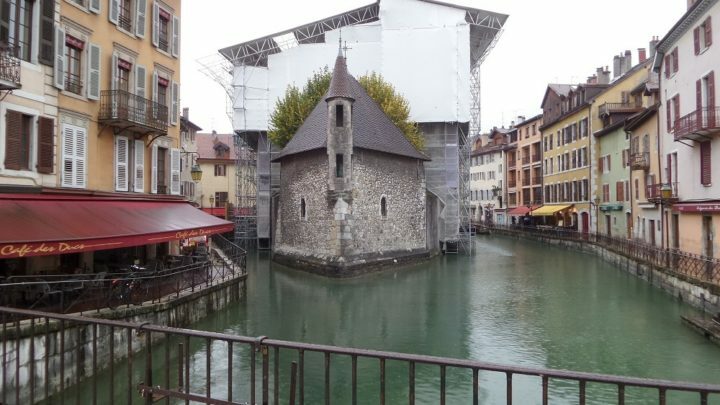 Annecy is a city in France and only a couple of hours’ drive from Switzerland. We would loved to have taken a detour there, not only to see the Swiss wonderland, but to catch up with an old mate from our Brisbane TV days. Annecy is famous for its spectacular lake, medieval township filled with canals, ancient bridges and 13th century architecture. The beautiful hotel we stayed at overlooked the gleaming lake, universally known for its clear waters protected from pollution by strong local laws put in place in the 1960s. Fed by pristine mountain streams, the lake is a wonderous attraction framed by walkways and cycleways, plus the odd beach here and there. We arrived in the evening after a big day on the road and had cocktails on the terrace as the sun set over the water. Next morning it was snowing gently as we drove out to negotiate our way through the picture-postcard snow-capped mountains. Even in the rain, it was magical. If this sounds a bit like a fairytale, it was! One of the most spectacular parts of the drive was through a 12km (7.5-mile) tunnel called the Fréjus Road Tunnel that connects France to Italy. Its one of the major trans-Alpine transport routes. It’s kind of eerie as you wend your way under a giant mountain range. It’s also 32 Euros (About AU$50) one way! Arriving in Italy, the landscape changes again. That is one of the pure joys of driving in Europe. Our next overnight is in Turin, or Torino as it was officially coined for the 2006 Winter Olympics (a decision made by the International Olympic Committee). Wow, what a place. Home to about 900,000 people, the city is filled with grand architecture, amazing cafés and is the spiritual home of chocolate! If you are into museums and history in general, Turin is abundant with them. Grand piazzas abound with royal palaces, spectacular riverside parks and there is a classic feel to the place. It’s rated by many as the next ‘must see’ behind Rome and Florence. Speaking of Florence, we reserved several days to look around this treasure trove. 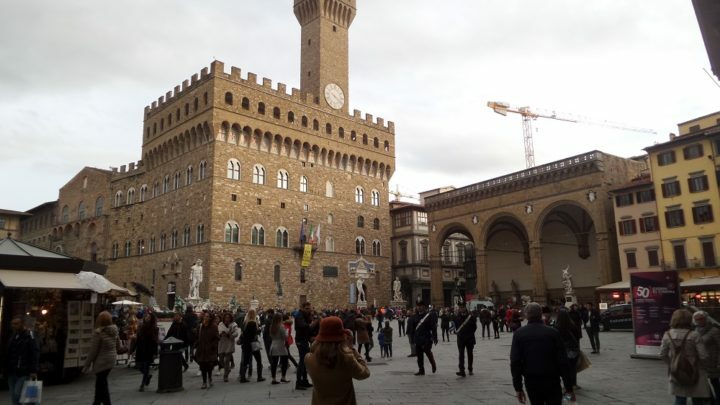 One of the most visited cities in the world, ‘Fiorenza’ as it was known during the Middle Ages, is home to 60 per cent off the world’s art treasures. Despite us being there in what is known as the ‘shoulder season’ (just off-peak) it was ridiculously busy. As we drove into the city guided by the GPS, skinny roads jammed with cars, people and thousands of scooters made it slow going. We sighted our inner-city hotel quite quickly, but could not turn toward it due to the one-way street. It took another 1.5 hours to get back there after getting lost in the maze of tight turns and narrow streets. It was worth the effort. Florence is one of those cities you instantly fall in love with. It is packed with famous attractions. I had recently seen a movie based on a Dan Brown book set in Florence. Breathtaking is one way to describe it. Gai, who is an art-history major and lover of Italian art, lapped up our time there and was disappointed when it was time to move on to our next destination. We were headed for the spectacular Umbrian mountains, located in Central Italy. Our assignment is to look after a gorgeous architecturally designed Italian villa perched high on a magnificent isolated sloping country property. It comes complete with stunning mountain views and two of the best dogs we have had the pleasure of caring for. Aah … Our home for the next six weeks. Have you travelled to France or Italy? What did you see?